Our homes are constantly a work in progress or at least I like to think they are. :) There always seems to be something to move, fix or improve. 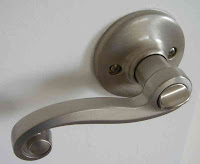 You know what they say…change a doorknob, remodel the whole room. That one doorknob starts an entire chain of action. 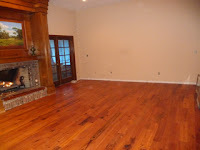 I recently had clients who updated their family room floors with beautiful reclaimed wood flooring. Then of course a coat of paint was needed to further refresh the room. Prompted by my "Are You Ready for Company?" newsletter and an upcoming party, my clients decided it was then the perfect time for a new room arrangement…enter Sharyn. 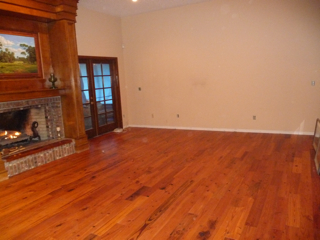 When redesigning a room, it is best to remove as much as possible to get a better feel for the space. In this case, that work was already done because they had to move everything out of the room in order to do the flooring. After assessing the furniture, deciding what to use and what not to use; a redesign plan was quickly formed. 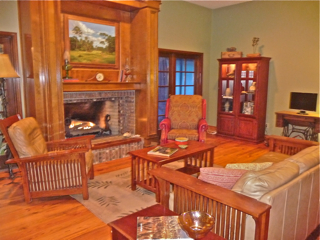 Bringing in the large pieces such as the sofa and two chairs, created a cozy sitting area in front of the fireplace. Displaying the homeowners' unique accessories and family memorabilia including a grandfather's old hat, a well used baseball glove and a vintage gator doctor bag adds character and charm. We used one-of-a-kind pieces such as floor lamps made by the homeowner who enjoys wood-working and creating unusual pieces. An interesting collection of antlers, turtle shells and a baby alligator - albeit stuffed - helped create the Old Florida theme. Your home is all about you...reflecting your personality through memory-filled treasures and pieces you love. Thanks for sharing this post. Displaying the homeowners' unique accessories and family memorabilia including a grandfather's old hat, a well used baseball glove and a vintage gator doctor bag adds character and charm.